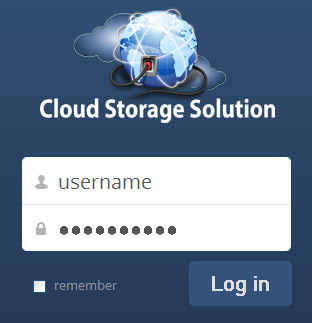 Download "How to Use JCWHosting Reseller Cloud Storage Solution"
1 How to Use JCWHosting Reseller Cloud Storage Solution Go to and log in with your Cloud Reseller account username and password. How to Use create a cloud account for your client Click on your Username top right corner and click on Users. Now you can insert a Username and Password for the client and click Create. 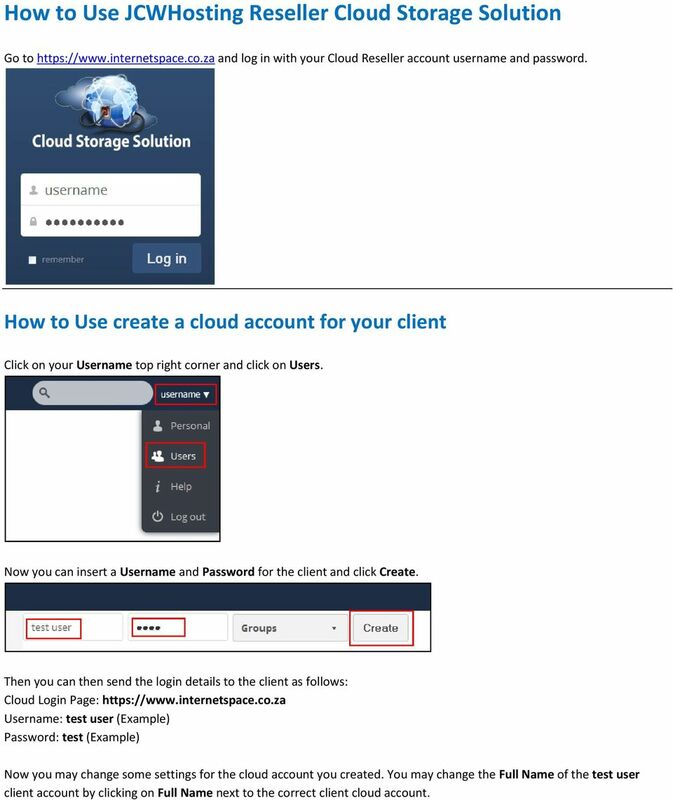 Then you can then send the login details to the client as follows: Cloud Login Page: Username: test user (Example) Password: test (Example) Now you may change some settings for the cloud account you created. 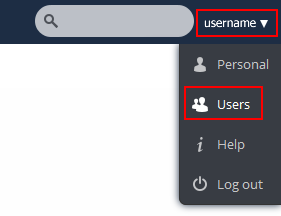 You may change the Full Name of the test user client account by clicking on Full Name next to the correct client cloud account. 2 Click on the password below Password to change the password of that account. To change the quota(amount of space) of the cloud account, you can click on the drop down menu below Quota next to the correct account. To delete the client cloud account, you can hover the mouse over the account the then click on the Recycle bin on the right hand side. How to Upload files First you need to log into your cloud account. As soon as you are logged in, make sure you are under the Files section. 3 Now you can upload a file by clicking the Upload button. Now you will see it will start to upload the file, you may click on the X icon to stop and remove the file upload. After that the file will be uploaded and available to share or download. How to Manage files As soon as you are logged in, make sure you are under the Files section and go to the place where you have uploaded your file. When you hover the mouse over the File, then you will see a few options: - Download: Click on this button to download the file to your computer. - Versions: Click on this button to check the version of the file. - Edit: Click on this button to edit the content of the file. - Share: Click on this button to Share the file with User or Group. You may also click on the Share link button below to be able to get a link which you can send to someone if you want someone else to download the file, without logging into the cloud account. Here you can also now the link to someone by filling in their address and click the Send button. You may also Password protect the file by clicking on Password protect. - Delete: Click on this button to delete the file. Using file upload software Files can also be uploaded using file upload software called owncloud. 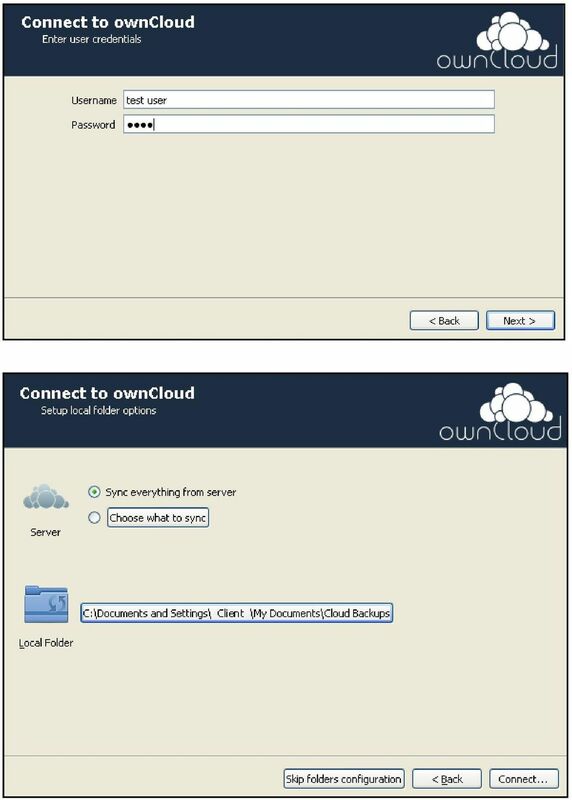 This can be downloaded from then click on Download Owncloud Now then scroll down to the bottom of the next page where it says owncloud Enterprise Desktop Clients. Choose your operating system then click Download. 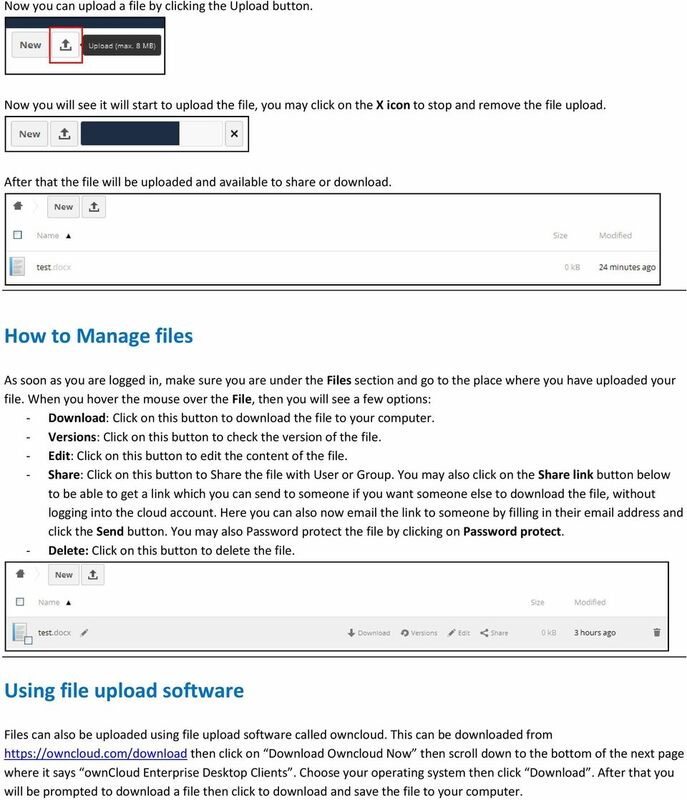 After that you will be prompted to download a file then click to download and save the file to your computer. 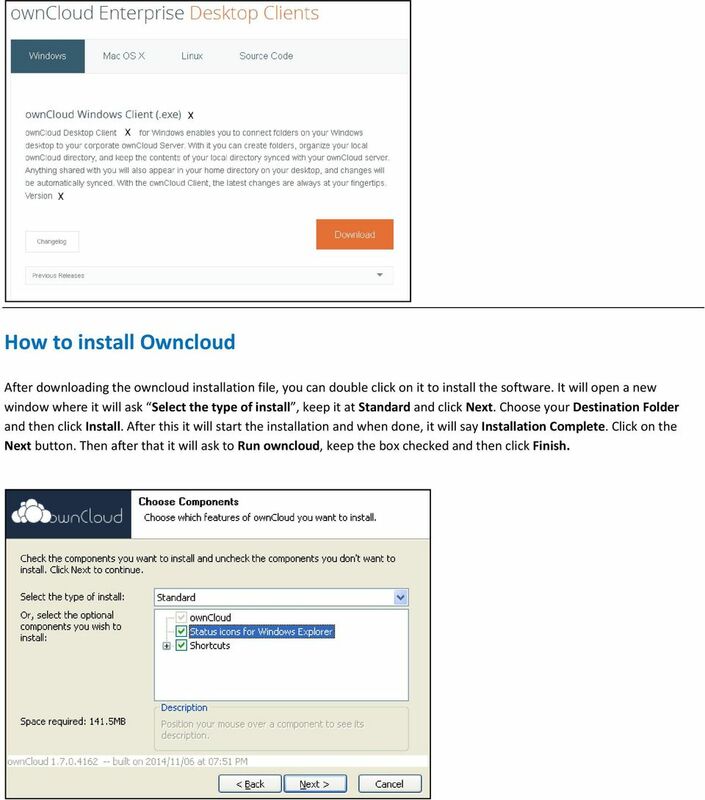 4 How to install Owncloud After downloading the owncloud installation file, you can double click on it to install the software. 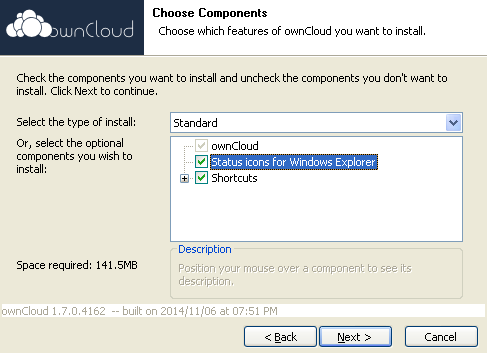 It will open a new window where it will ask Select the type of install, keep it at Standard and click Next. Choose your Destination Folder and then click Install. After this it will start the installation and when done, it will say Installation Complete. Click on the Next button. 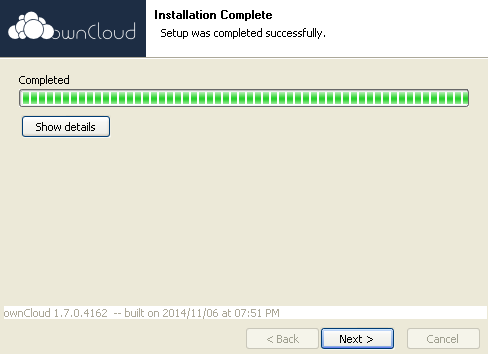 Then after that it will ask to Run owncloud, keep the box checked and then click Finish. 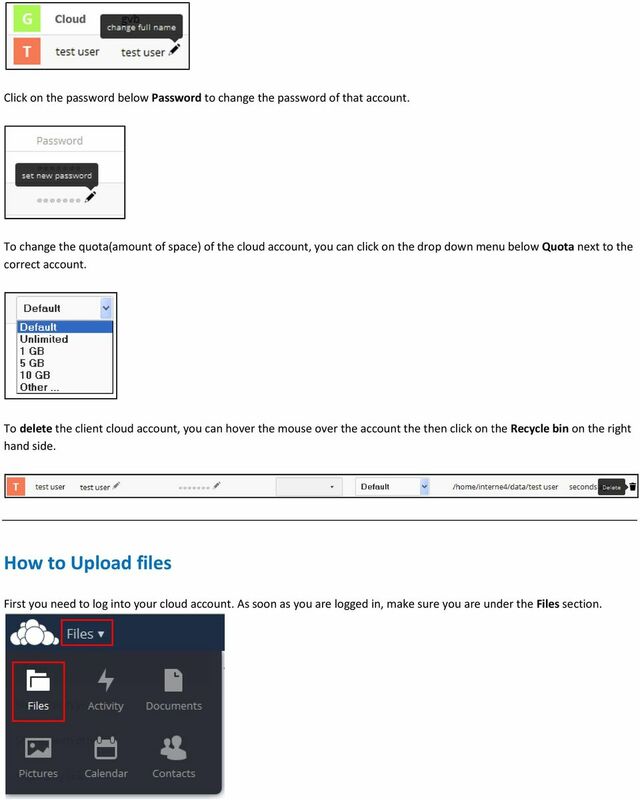 6 How to use Owncloud As soon as you open Ownload the first time, it will ask for a Server Address, you can then enter the following and click Next: Now it will ask for a username and password, here you need to enter the Username and Password of the account you created for your client. Username: test user (Example), Password: test (Example). 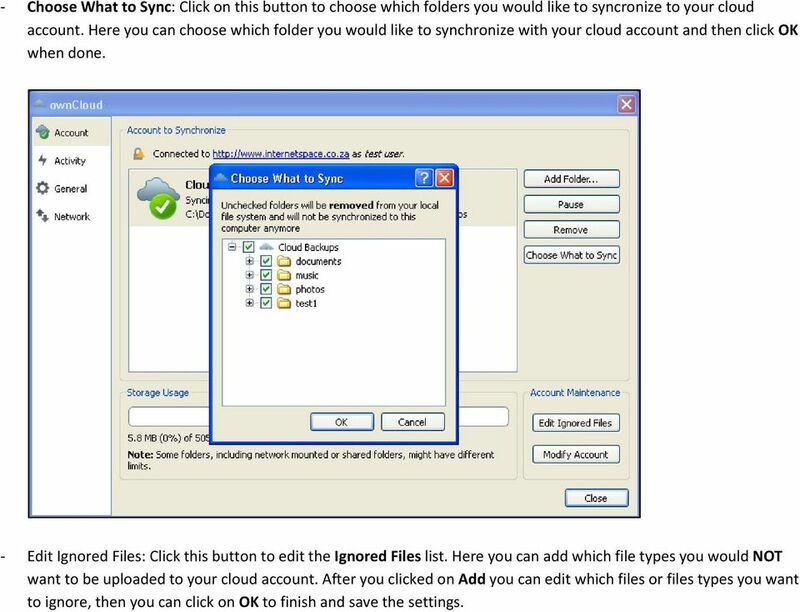 On the next frame you can choose what you what like to Sync and which folder you would like to use on your computer to sync the files to your cloud account. At Server you can keep the setting at sync everything from the server to Sync everything from the cloud account to your computer and vice versa. Before you proceed at the bottom where it asks for Local Folder, go to your hard drive or documents folder and create a folder with the name Cloud Backups. Now where it says Local Folder click on the button next to Local Folder, then browse to the Cloud Backups folder and choose that folder. BEFORE YOU PROCEED: As soon as you click the Connect button, it will download everything you have chosen at Server from the client s cloud account to the Cloud Backups folder on your computer. From this moment on it will keep it synchronized until chosen otherwise. Now you can click Connect. We will change the Synchronization settings in the next topic. On the next window you can click on Finish. When the synchronization is complete, it will show a message which says Sync Activity with the amount of files download or synchronized. 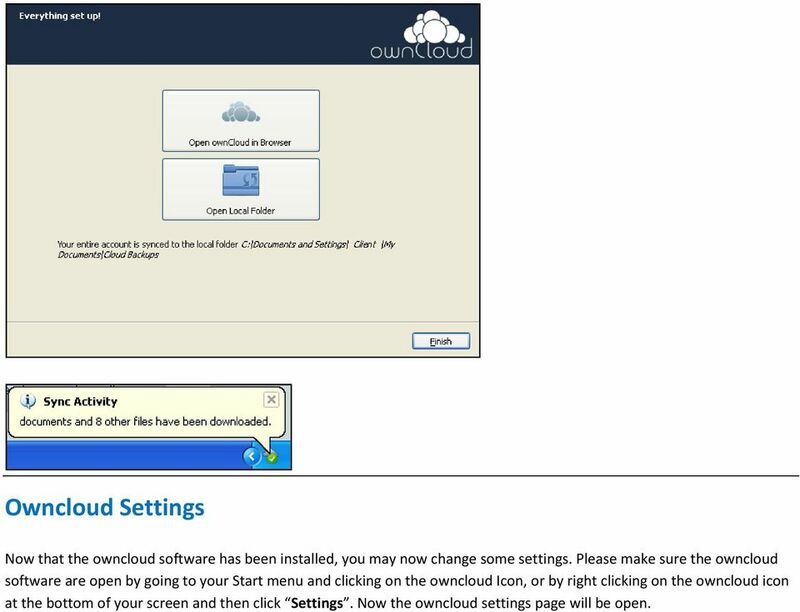 8 Owncloud Settings Now that the owncloud software has been installed, you may now change some settings. Please make sure the owncloud software are open by going to your Start menu and clicking on the owncloud Icon, or by right clicking on the owncloud icon at the bottom of your screen and then click Settings. 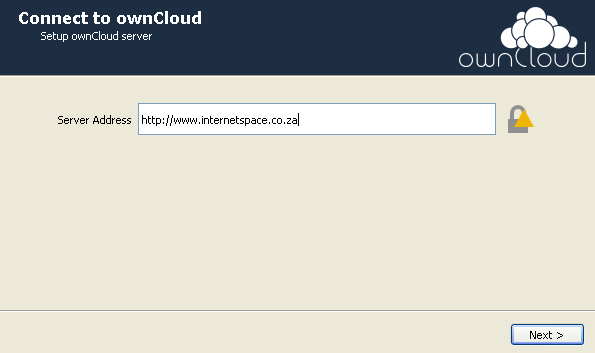 Now the owncloud settings page will be open. 9 You will now see the following options top Right of the window: - Add Folder: Click on this folder if you want to synchronize folders from your computer to the cloud account. However, this function may not work if you are already synchronizing everything from within the Cloud Backups folder to your Cloud Account. So if you need synchronize more information from your computer, all you have to do is place the data inside the Cloud Backups folder and then make sure that synchronization are on. 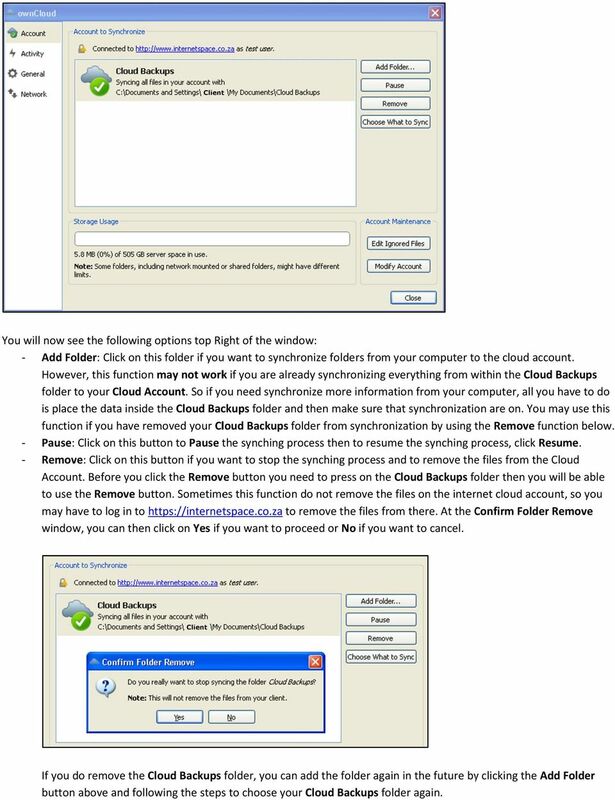 You may use this function if you have removed your Cloud Backups folder from synchronization by using the Remove function below. - Pause: Click on this button to Pause the synching process then to resume the synching process, click Resume. - Remove: Click on this button if you want to stop the synching process and to remove the files from the Cloud Account. Before you click the Remove button you need to press on the Cloud Backups folder then you will be able to use the Remove button. Sometimes this function do not remove the files on the internet cloud account, so you may have to log in to to remove the files from there. At the Confirm Folder Remove window, you can then click on Yes if you want to proceed or No if you want to cancel. 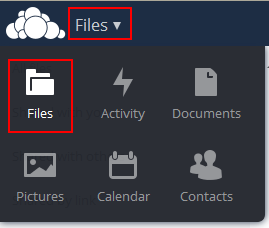 If you do remove the Cloud Backups folder, you can add the folder again in the future by clicking the Add Folder button above and following the steps to choose your Cloud Backups folder again. 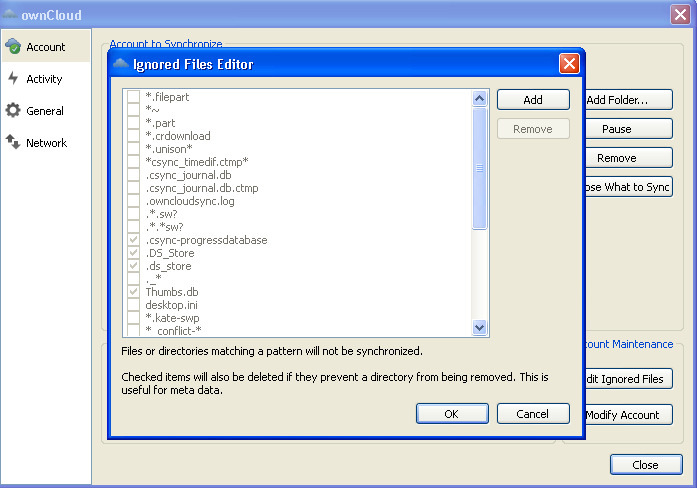 10 - Choose What to Sync: Click on this button to choose which folders you would like to syncronize to your cloud account. 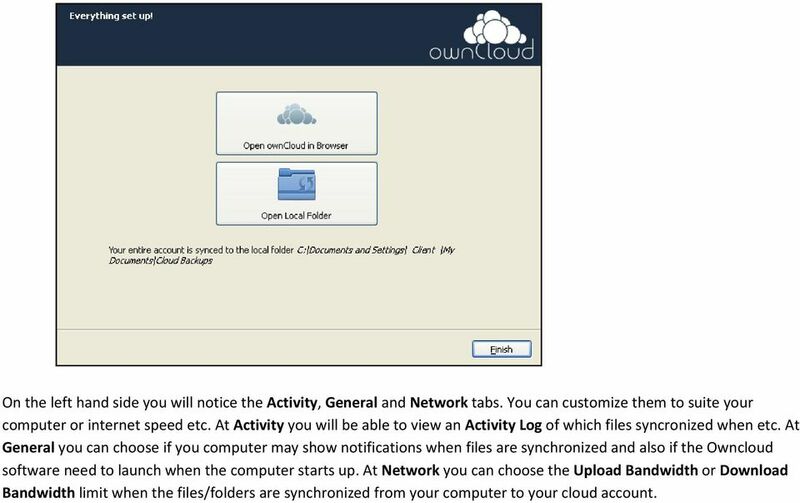 Here you can choose which folder you would like to synchronize with your cloud account and then click OK when done. - Edit Ignored Files: Click this button to edit the Ignored Files list. Here you can add which file types you would NOT want to be uploaded to your cloud account. After you clicked on Add you can edit which files or files types you want to ignore, then you can click on OK to finish and save the settings. 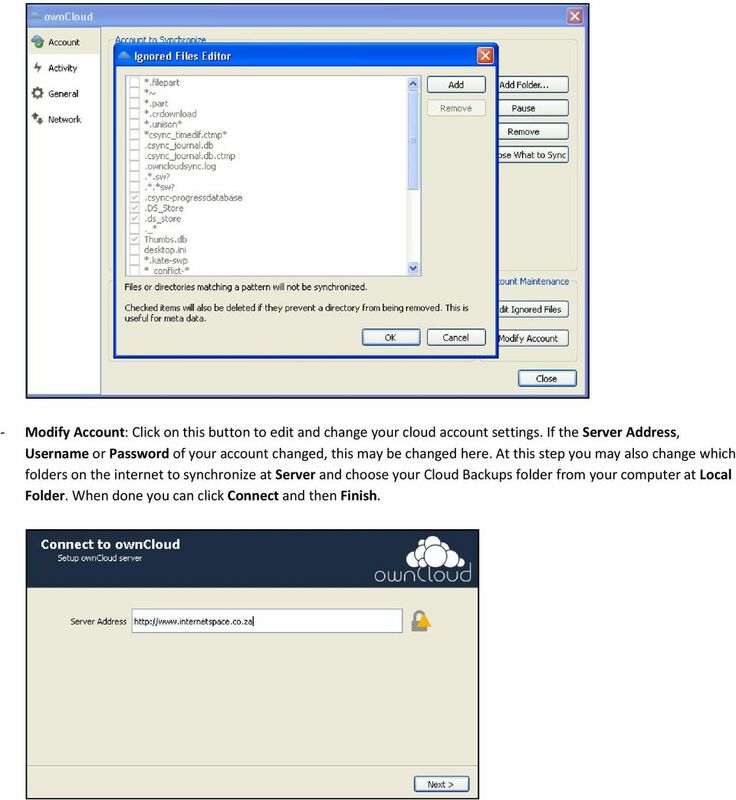 11 - Modify Account: Click on this button to edit and change your cloud account settings. If the Server Address, Username or Password of your account changed, this may be changed here. 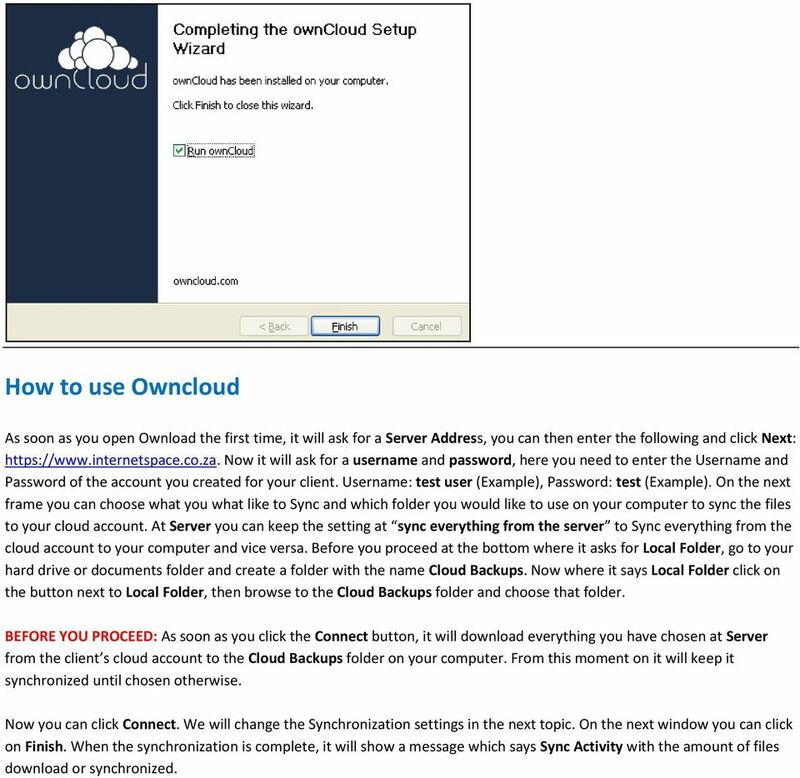 At this step you may also change which folders on the internet to synchronize at Server and choose your Cloud Backups folder from your computer at Local Folder. When done you can click Connect and then Finish. 13 On the left hand side you will notice the Activity, General and Network tabs. You can customize them to suite your computer or internet speed etc. At Activity you will be able to view an Activity Log of which files syncronized when etc. At General you can choose if you computer may show notifications when files are synchronized and also if the Owncloud software need to launch when the computer starts up. At Network you can choose the Upload Bandwidth or Download Bandwidth limit when the files/folders are synchronized from your computer to your cloud account. Google Apps Sync for Microsoft Outlook Sync your MyIIT Password to Google Apps 1. Log in to the MyIIT portal. (my.iit.edu) 2. Click Content Layout and add the Google Apps Account Maintenance Channel 3.
powered by Logging into Help Desk 1. Go to http://helpdesk.hslc.org. 2. Login using your username and password. 3. Are you creating a new Help Desk ticket? If yes, see Creating a New Help Desk Ticket.